18730 Se Pineneedle Lane Tequesta, Fl 33469 has been sold. IT'S ALL ABOUT THE VIEW! THIS FULLY RENOVATED TOWNHOME ON THE VILLAGE COURSE OF JUPITER HILLS OFFERS THE BEST OF THE BEST. TWO STORY VIEWS OF THE 14TH & 15TH HOLES PROVIDE A VISTA THAT HEALS THE SOUL AND TAKES THE BREATH AWAY. OFFERING 3 BEDROOMS WITH 3 FULL & 1 HALF BATH, JUST OVER 3,000 SQ. FT. UNDER AIR, THE ENTIRE FAMILY WILL ENJOY THE CASUAL ELEGANCE THIS HOME OFFERS. A BEAUTIFUL DOWNSVIEW EAT-IN KITCHEN OPENS TO THE GREAT ROOM/DINING ROOM AND IS WHERE FAMILY AND FRIENDS WILL GATHER FOR EVERY OCCASION FROM WATCHING GOLF TO ENJOYING COCKTAILS AND CELEBRATING SPECIAL OCCASIONS. PERCHED ON THE SECOND LEVEL, THE MASTER SUITE HAS VIEWS THAT GO ON AND ON. DOUBLE SINKS, WALK IN CLOSET AND LARGE WALK IN SHOWER MAKE IT THE PERFECT HIDEAWAY. PROPERTY SOLD FURNISHED, LIST OF EXCLUSIONS APPLY. 18730 Se Pineneedle Lane located in Tequesta, FL is a townhome with 3 bedrooms, 3 full baths and 1 half baths.The Townhome at 18730 Se Pineneedle Lane was built in 1988 in Jupiter Hills and offers a 2.5 car garage. This Jupiter Hills Townhome offers pool, tennis, street lights. 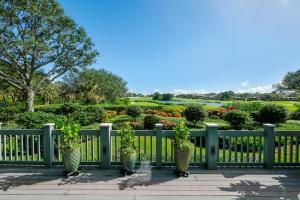 18730 Se Pineneedle Lane Tequesta, Fl is currently listed for $875,000 under the MLS# RX-10384861. This Townhome has been put on the Tequesta MLS system and currently has a status of SLD.